The applications really are endless! Having one film in your shop that can be used for multiple applications will free up space, while saving you money. High performance with the perfect balance of body and conformability makes DPF 4600LX the ideal everyday film. 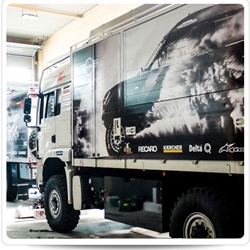 Whether you have a partial vehicle wrap, interior wall graphics or a window graphic to install, DPF 4600LX will provide you with a bubble-free installation and a smooth finish. Since all good things come to an end, when you’re ready to remove your wrap you can count on a clean removal. Roll Widths: 30", 54", 60"